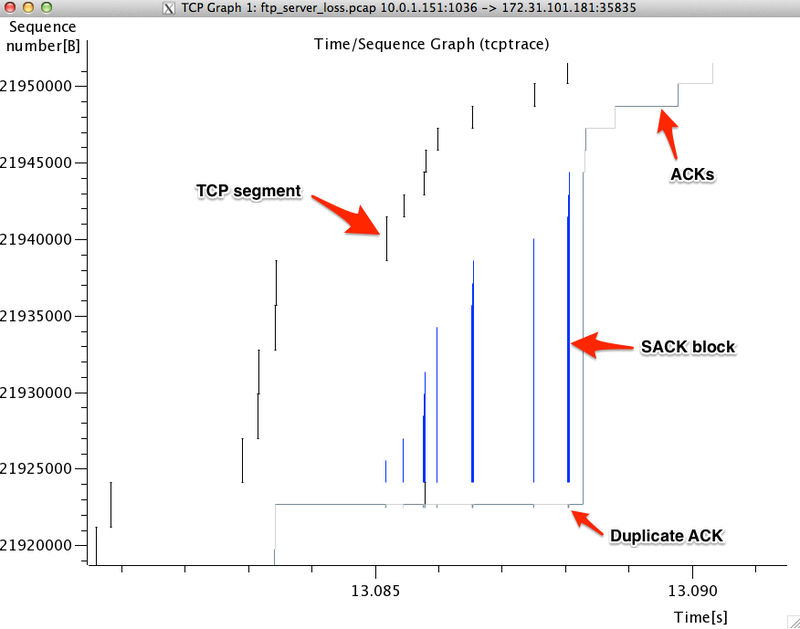 If I’m troubleshooting a performance issue, one of the first tools I reach for in Wireshark is under Statistics > TCP StreamGraph > Time-Sequence Graph (tcptrace). At a glance I can tell if this is going to be an easy one to analyze or if I’m gonna have to roll up my sleeves and dive in deeper. I’ll be showing you how to use the time sequence graph in my next video, but for now let’s talk about how to interpret the lines and colors and markings. The Time-Sequence graph shows a data stream over time. By definition, a stream is moving in one direction. So if a client is downloading a file from an FTP server you must click on a packet from the server before generating the graph. Again, it is only showing you data flowing in one direction. The x-axis is time. So this shows seconds e.g. 2.35 seconds. The y-axis is TCP sequence numbers. Sequence numbers are representative of bytes sent. The sequence number increases by 1 for every 1 byte of TCP data sent. Ideally you’d want to see a smooth line going up and to the right. The slope of the line would be the theoretical bandwidth of the pipe. The steeper the line, the higher the throughput. The top line represents the calculated receive window of the client. This is the ACK number plus the current advertised receive window. If the current ACK is 40,000,000 and the advertised receive window is 1,200,000 then the calculated receive window will be at 41,200,000. The distance between the current TCP sequence number (40,400,000) and the calculated receive window (41,200,000) is how much data the client can buffer (800,000). We still have the TCP segment data and the ACKs represented as before. Now we have two new things in regards to data loss and recovery. Duplicate ACKS are represented as small ticks on the underside of the ACK line. SACK blocks are the blue lines above the tick marks i.e. dup ACKS. I’ll go over this in further detail in the next video. If you’re not sure what advertised receive windows, dup ACKS, or SACK blocks are, no worries, it will all be revealed in good time. Bookmark this page and reference it in the future. 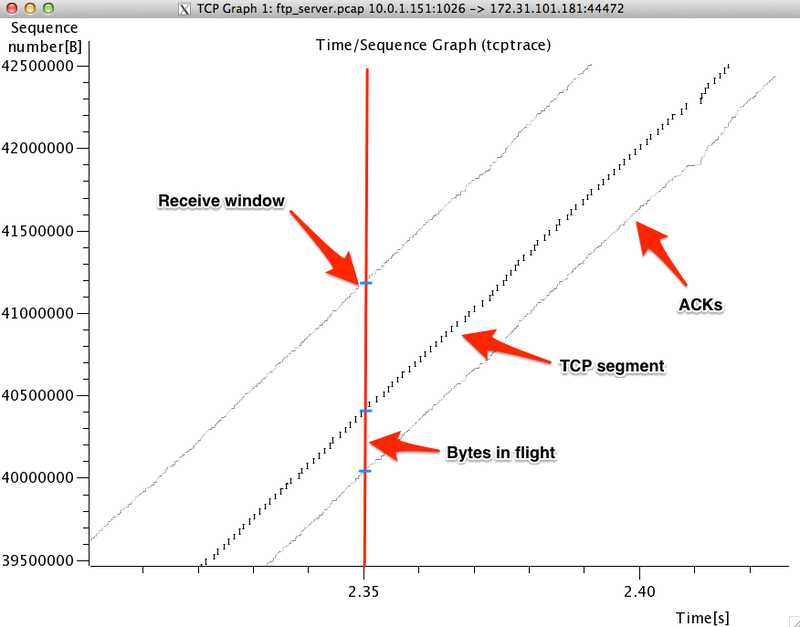 If you have any tips or tricks for the tcptrace Time-Sequence graphs, leave a comment! If you’d like to see some examples of good and bad time-sequence graphs, subscribe to the newsletter and get access to the additional videos. That’s a good point. If you want the sequence numbers in the graph to match the sequence numbers in the trace, then enable relative sequence numbers. Though I would argue that that actual sequence number in the graph isn’t all that important. Future videos will make extensive use of the tcptrace graph and will show good and problematic graphs. What version of Wireshark is this…? I have never seen three lines in any version I’ve had. I have a really strange throughput graph…is it possible to upload an image? My TCP knowledge is very limited so I’m trying to understand the line when you say “The top line represents the calculated receive window of the client. This is the ACK number plus the current advertised receive window.” Can you elaborate this and isn’t the receiver window calculated from the scale factor in the HS? thank you for taking your time to share such wonderful knowledge. Please make more ;) these are very helpful for my job. Yes, the receive window is calculated from the scaling factor. However, in the context of this graph, we take that calculated receive window and add the current ACK number to get the receive window line on the graph. This way we get a visual representation of how much space there is in the receive buffer. The more space there is between the data line and receive window line, the more space there is in the buffer. A huge factor in actually seeing the graph correctly will depend on whether you have an inbound or outbound packet selected in the packet window. If you dont see anything try clicking a packet from the other direction in the conversation. Wireshark 2.x has a button called Switch Direction to make this more convenient. They also let you select the stream directly in the TCPTrace window. Very handy stuff. Thanks for the good article, the WCNA book doesnt break this down as well as you did!